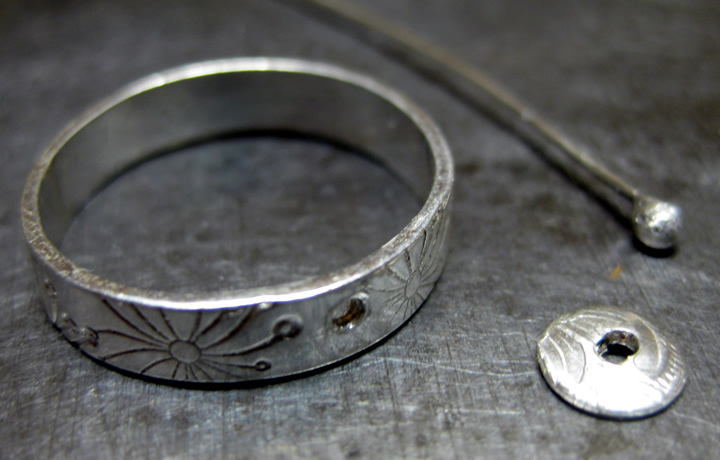 A Setting A Day – Day 7 – Riveted or Wrapped ! 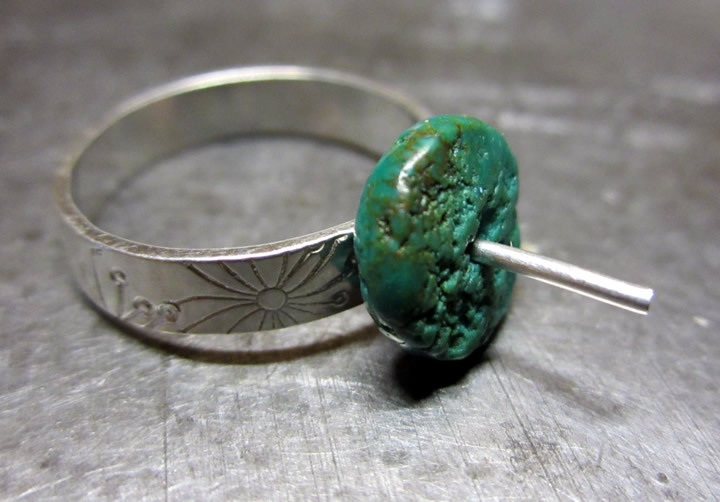 Two ways to make this turquoise ring. 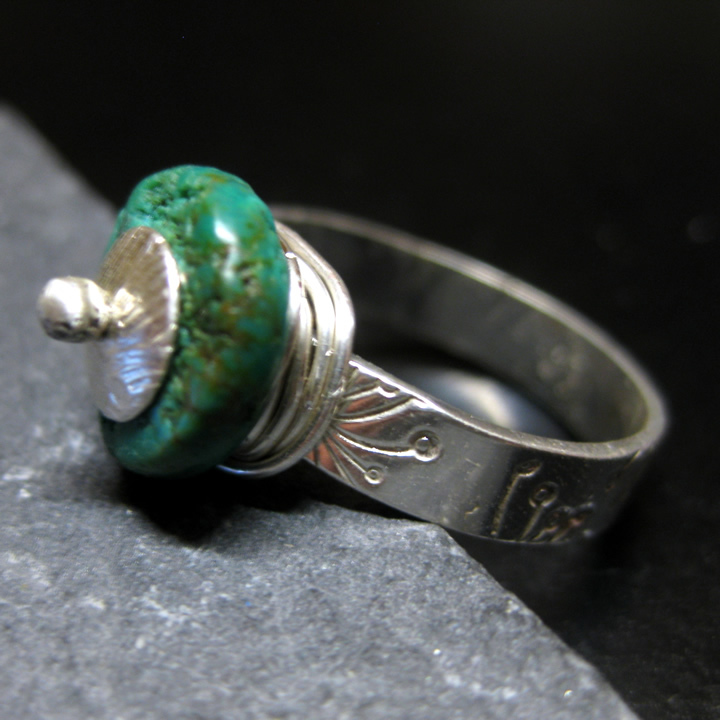 Well I actually managed to meet my own challenge this time and post every day for a week about different types of settings or how to bring stones into your jewellery. 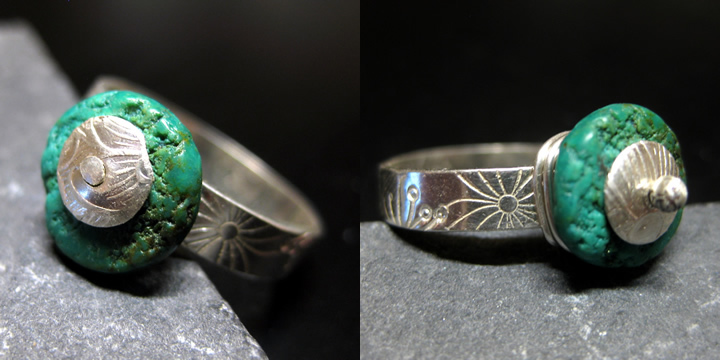 Todays I’m going to show you 2 different ways of making a ring with similar results. The one on the left is Riveted and the one on the right is Wrapped. 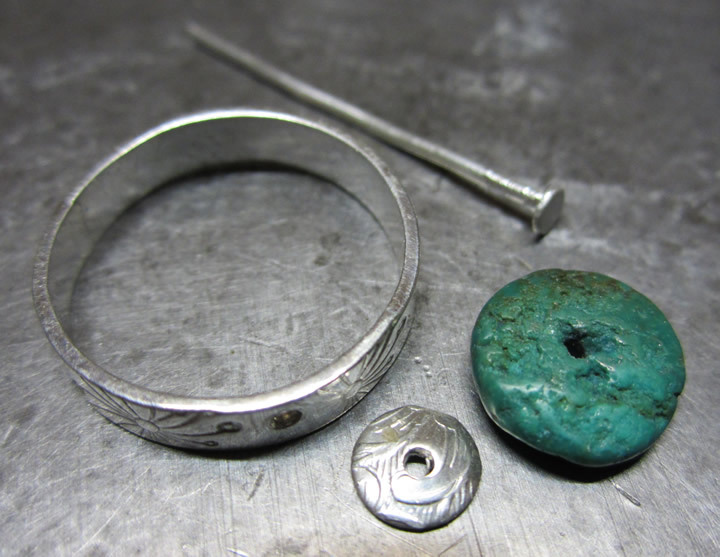 IMPORTANT – For riveting to be successful the holes in the ring, beadcap and bead must be just a tiny bit bigger than the rivet (just enough for the rivet to pass through) REMEMBER to wear goggles when riveting ! This technique is a lot more forgiving – as long as the wire (I used 0.6mm wire) can go through the bead and the holes in the ring bead cap and it should work and it doesn’t matter (within reason 😉 that the holes are bigger than the wire (my ring has a 1.2mm hole). Thread the wire though the beadcap, bead then ring and tightly bring the wire up around the ring next to the bead, then around the other side of the bead. Wrap the wire around and under the bead and make sure when you have wrapped enough times the last wrap is tight and the end is tucked away safely – you can see the underneath of my ring in this photo. This is the last day of my Setting A Day – please do visit the other days – I hope you find them interesting enough to leave a comment. If you follow my blog you’ll receive an email each time I add a new post. A Setting A Day – Day 4 – Fabulous Tube Setting ! 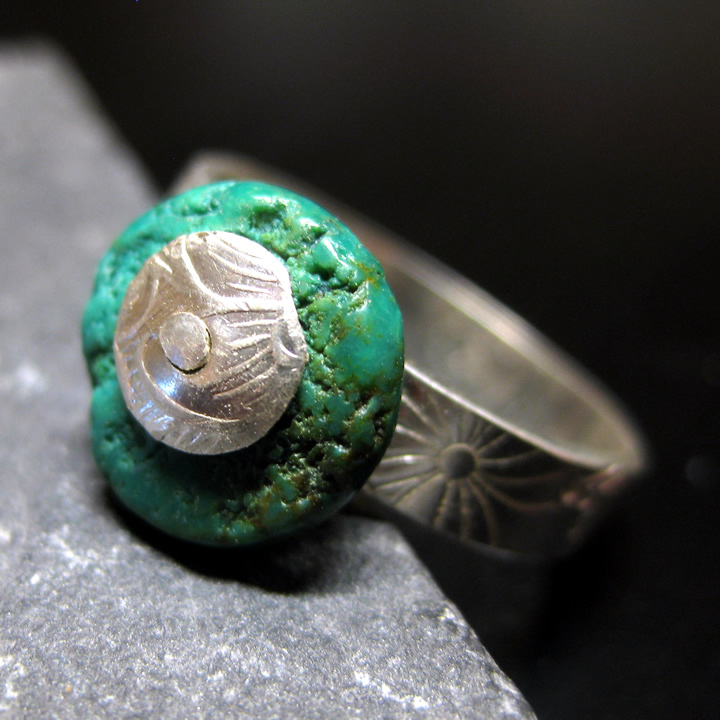 A Setting A Day – Day 5 – Fab Sea Glass Rings ! 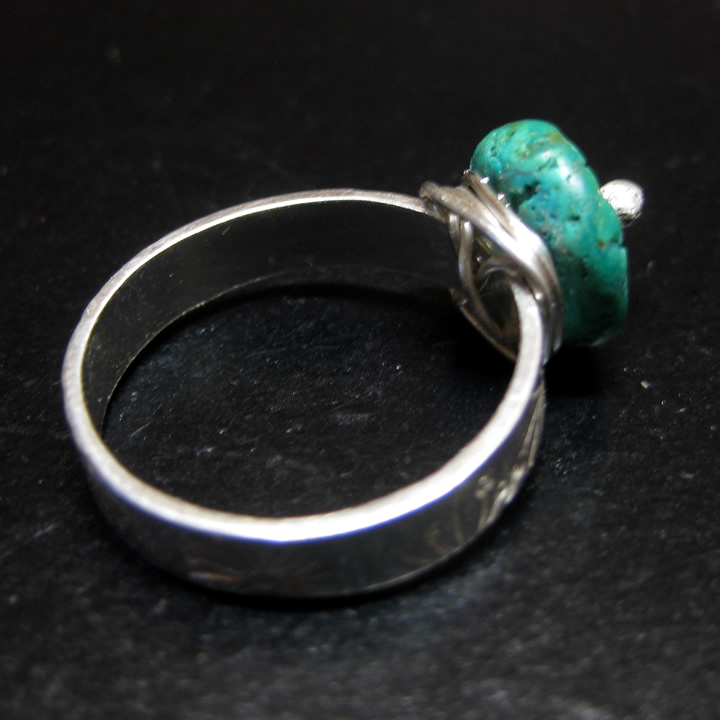 This entry was posted in Jewellery, Kits, Rings, Riveting and tagged turquoise, wrapping. Bookmark the permalink.